Toenail clipping is an essential part of keeping a dog well groomed. 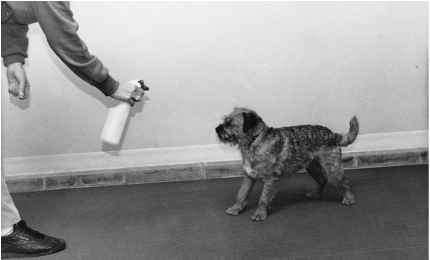 It is a procedure that is often ignored by many dog owners. If your dog's toenails click when he walks across a hard surface, they are too long. He should not be walking on his toenails; that is bad for your dog's feet. Because a dog's toenails should be cut every two to four weeks, it is impractical to let this go until a groomer or veterinarian can do it. Toenail clipping is also an excellent test of your dog's ability to accept restraint. 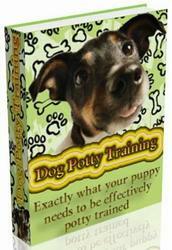 It teaches a dog to tolerate something unpleasant but necessary, a part of many medical treatments. Such training enabled my husband, who is a physician, to stitch up one of our dogs in an emergency situation without anesthesia. A dog who was visiting attacked my Borzoi over a food bowl, lacerating her face, with some of the cuts very close to her eyes. Unfortunately, this happened during a terrible blizzard. It was impossible to get to a veterinarian. Carla cooperated by lying on her side very still while Brad stitched up her face. Start by downing your dog and laying him on his side. In grasping his paw, be careful not to pull his leg into an unnatural position or get such a death grip on his paw that you are hurting him. If he struggles, do not get someone else to help you hold him. The idea is not to physically hold him in place, but to have training hold him in place. If he struggles too much, go back to last week's lesson and practice some more. Until he gets comfortable with this, you may be able to cut only one toenail at a time. This helps limit the stress for both the owner and dog. 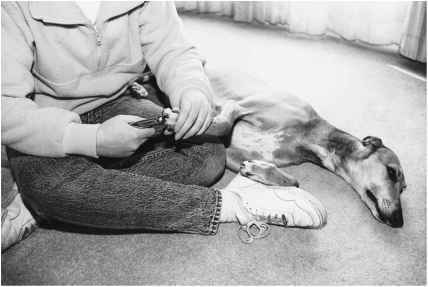 A good way to help hold your dog in position and make toenail clipping a positive experience is to use squeeze cheese or peanut butter in a tube. Someone else will have to help you with this. Let your dog lick the cheese or peanut butter as your helper squeezes out small amounts. Then you can clip his nails while he is distracted. You can also spread some of these treats on a spoon for your dog to lick. A friend of mine even puts a big glob on her refrigerator for her dog to lick as she clips. 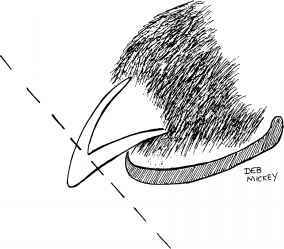 The dotted line indicates the proper place to cut the toenail. If your dog has light-colored nails, you're lucky. It is easy to see where the quick ends and where to cut. If your dog has dark nails, you will have to guess. The quick generally ends where the nail starts to curve down. Don't panic if you cut a little too much and your dog starts to bleed. If you don't overreact, he won't. Apply some pressure on the nail with a paper towel until the bleeding stops. It is helpful to have on hand a special styptic powder made to stop bleeding toenails.